Organizing a wedding is not a simple task, especially when you plan to organize a destination wedding. This is where you can benefit from the expertise of a Wedding Planner. Our Events Planner and the Signature Weddings team, will take you through every step of the planning process for your dream wedding in these tropical island destinations; Koh Samui and Phuket, from the initial enquiry right up to the wedding day. Working closely with you, the Wedding Planner will be your contact person for the wedding ceremony, reception, rehearsal dinner, activities, etc. 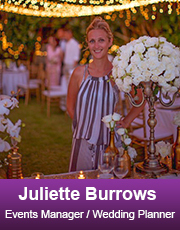 She will take you through the various stages of wedding planning and help you achieve the perfect wedding without losing your sanity. All of your wedding information will be on file and follow-ups will be made by the Signature Wedding team to make sure that you and your party has everything needed for the wedding ceremony. If you have any questions or any special requests, our Events Planner and the Signature Weddings team are there to give you personal assistance. Once you arrive on the island, a meeting with the Wedding Planner and her team will be made at a convenient time and venue. At the meeting, all details about your choice of flowers, choice of music, choice of cuisine, colour scheme, cake flavours including the order of the service shall be discussed, finalised and confirmed. Right before the wedding day, the Team will go through every single detail to make sure that everyone is on the same page so everything runs smoothly. On the big day, our dedicated team will help with the wedding set-up and each of them will be right there to ensure that you will have the most perfect wedding day that you always dreamed of. Let your Wedding Planner organize everything for you while you relax and enjoy the tropical island.